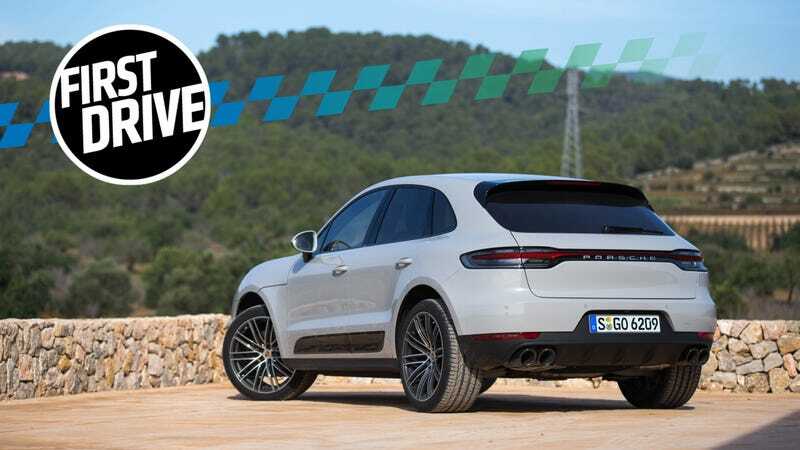 On the tight and viciously twisty Mallorcan mountain roads, I watched the 2019 Porsche Macan S leading me handle a hairpin with more ferocity than a mid-size crossover has any right to. It leaned heavily into its suspension and from the outside, it looked quite precarious. But, as we were keeping up with it just fine in our test car, I knew that what the they were feeling on board was exactly what I felt. And what I felt was confidence. Don’t be fooled by the size; the Macan is light on its feet and it can handle. Believe it or not, the Macan’s been around since 2013 now. It shares the Audi Q5’s platform and, as of this writing, is the German automaker’s highest-selling model of 2018. Since the end of November, Porsche has sold 22,159 Macans, as compared to 9,350 Cayennes and 7,710 Panameras. For 2019, it’s not all-new, but it is heavily updated. Besides the heckblende taillight, the revised Macans now have a wider-looking face because the designers revised the side air intakes slightly and redesigned the headlights. 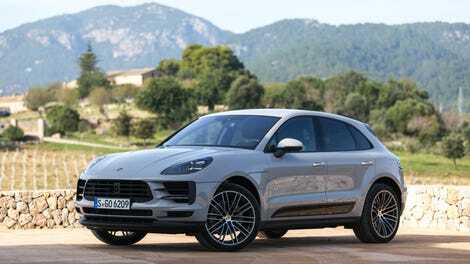 Macan S models will come debadged, while base Macan models will simply say “Macan” on the trunk. Without a doubt, the Macan is one of Porsche’s more lucrative cash cows, and represents the automaker tapping directly into the SUV and crossover fervor that’s sweeping the globe. But just because it’s a crossover doesn’t mean that it was unpleasant to drive. Very much the opposite. The base Macan sticks with a 2.0-liter, turbocharged inline four-cylinder engine, good for a claimed 248 horsepower and 273 lb-ft of torque. The Macan S drops the twin-turbo V6 of the outgoing model and instead uses the single-turbo, 3.0-liter V6 first found in the Panamera and the Cayenne. That turbo is now located in the V of the engine, which produces 348 HP and 354 lb-ft of torque. These new figures now put the Macan S right within spitting distance of the BMW X3 M40i, which has 355 HP and 365 lb-ft of torque from a 3.0-liter, turbocharged straight-six. Both of the Macan’s engines are mated to Porsche’s seven-speed dual-clutch transmission and come with all-wheel drive as standard. Porsche claims that the base model’s top speed is 142 mph with a zero to 60 time of 6.3 seconds (6.1 with the Sport Chrono), while the S will do the sprint in 5.1 seconds (4.9 with the Sport Chrono). Top speed is a claimed 157 mph. And apparently it can even tow 4,409 pounds, as long as your trailer has brakes. The Macan is comfortable, easy to drive and practical. Its trunk will fit a set of medium-sized suitcases from a small family or two large suitcases from two pack rats. The back seats provide ample headroom, though passengers might want to get out and stretch their legs after a while, as there isn’t a ton of legroom. The cargo area volume of the trunk with the back seats up is 17.7 cubic-feet, while the volume of the seats down is 53 cubic-feet. It’s a little tighter than the BMW, which has 28.7 cubic-feet and 62.7 cubic-feet of space with the seats up and down, respectively. I would not have found that on my own. And it’s a handsome crossover, this Macan. It doesn’t just look like a shoe like most of these things do—it actually looks pretty athletic. And I really do like the new rear light bar. It gives the back a very minimalist feel, and potential disruptions in that minimalism, like the rear hatch button, are cleverly hidden away. Despite its size and higher center of gravity, the Macan does feel like it shrinks around you. Especially in the tighter roads. The body roll is discernible, but it is a small amount and doesn’t induce panic. You don’t feel like you’re about to flip over if you turn too sharply. The chassis keeps things very controlled and predictable, which lets you flick the car around with assurance. And all of this just means that the upcoming Macan Turbo and GTS will be even more incredible than they already are. I had hoped that Porsche’s button-heavy interior layout would finally depart, but it hasn’t. There are a lot of buttons in the Macan, and this is coming from someone who really, really likes buttons. The center console is festooned with buttons and there are more to be found on the ceiling, too. Too many buttons, and so many of them end up blank. We need to have an intervention with Porsche on this, because it’s been a frequent complaint on many of its cars, from the 911 on down. The power figures of the Macan S sound good on paper, but in practice, I found the car’s acceleration to be a little lackluster. Don’t get me wrong, the low-end power is phenomenal; the AWD system helps it really dig into the pavement and fully utilize all the car’s torque. But that same forward enthusiasm pretty much dies out by the mid- to high-rev range. The problem is that then the engine feels like it runs out of juice halfway through. That V6 will help you merge, pass and whatever else you need it to, but it probably won’t excite you past about 4,000 RPM. Surprisingly, the base Macan was far more enjoyable to me than its more powerful Macan S sibling. Though it was missing two cylinders and was lower on power, it didn’t feel hobbled in the slightest. According to the spec sheet that Porsche sent us, it isn’t outfitted differently from the S, either, so it all comes down to a power and weight game. The base weighs a reported 4,099 pounds, while the S is 4,239. Even in a shorter drive in the base car, I could already tell that it was the lighter-footed of the two. The steering was far more dialed-in because there wasn’t as much engine sitting over the front axle and its acceleration felt more satisfying. It was more exciting. I felt like I was moving with a little more urgency. This, I presume, is because Porsche has tuned the maximum amount of what it needs out of the 2.0-liter already. The four-cylinder feels engaging and snappy because that’s the most that Porsche is going to offer out of it. The V6, on the other hand, feels lazy because Porsche has to make room for the upcoming performance variants, like the Turbo and the GTS. The V6 in the S needs to slot below the more expensive options, while the four-cylinder faces no such restrictions. More and more so, I find that I am less impressed by what a manufacturer claims a car can do and more so what I feel it can do. The S might be for someone who has some prejudice against buying base and is attracted to higher performance figures, but the regular Macan is the better one for driving. And if you do get the base, you’ll save yourself nearly $9,000, as it costs $49,900, while the S costs $58,600. They look basically the same anyway. It’s just too bad that the Macan doesn’t use the 718’s turbocharged flat-four. The engine probably doesn’t fit in a Macan’s engine bay, but that’d make for one interesting crossover. But you’ll have plenty of fun in this, regardless of how the cylinders are laid out. What Do You Want to Know About the 2019 Porsche Macan?